Nothing looks as festive as a bunch of bright, colorful lights concentrated into a tight space. And for that, I heartily recommend an addressable LED strip. It's very bright, super vivid, and easy to hookup. 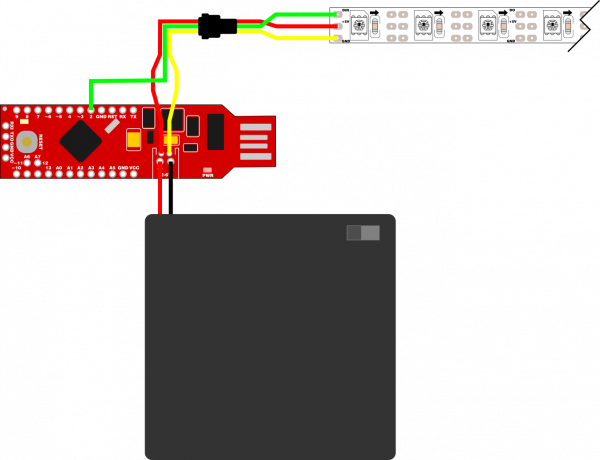 This tutorial covers all of the wiring and code necessary to light up a single string of addressable LEDs with just a RedStick and a AA Battery Pack. If you've never worked with addressable LEDs or with the RedStick, we recommend checking out these other guides first. For the purposes of this tutorial, I'm going to assume that you have some very basic soldering experience. There are only a handful of connections that you'll need to solder, so this isn't a bad project to start with However, if you are using this as your introduction to soldering, we strongly suggest reading this tutorial first. 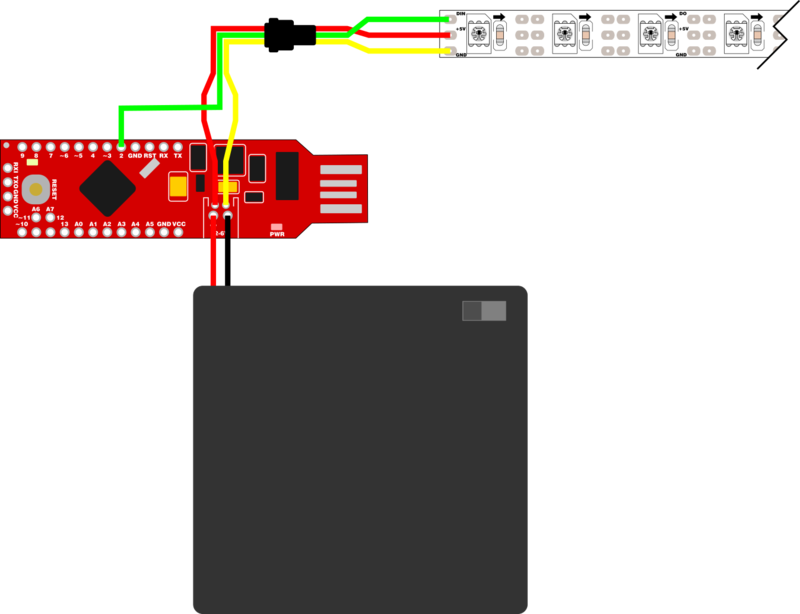 Addressable LED strips, like the one in this tutorial, tend to use a standardized 3-pin connector. This makes it easy to chain multiple LED strips together. Because the battery pack included with this project is not going to support a lot more than the 60 included LEDs, you may find it convenient to cut the female connector off the "out" end of the strip and solder it to the RedStick to make your LEDs detachable. Warning: **Make sure you're cutting the right connector! ** Look at the little black arrows on the LED strip. You want the connector with the arrow pointing *toward* it. The diagram below illustrates the handful of connections that you'll need to make. 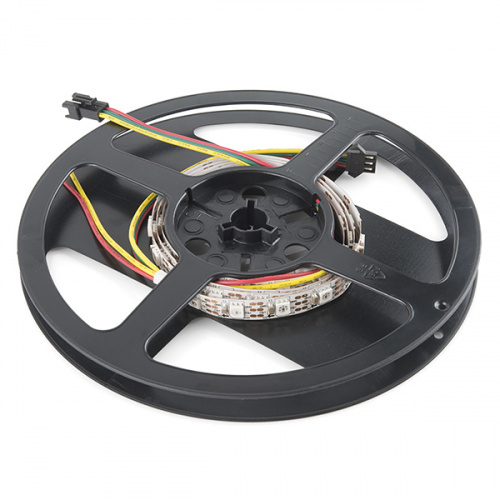 You'll notice that the red and yellow wires from the LED strip are connected directly to the battery connector. You may be tempted to connect them to the GND and VCC pins on the RedStick, but don't do that. The VCC pin draws current through the on-board voltage regulator, which isn't rated for the high current that the LEDs require to operate. If powered from VCC, the regulator will definitely get hot and may fail altogether. Once your LED strip is wired up, you can load some Arduino code onto the RedStick to animate the lights! For our example code, we'll be making use of Adafruit's fantastic NeoPixel library. Click here to download a copy of both the example code, as well as the NeoPixel library. The library is located in the "Adafruit_NeoPixel" folder, and the example code is found in the "WS2812_Breakout_Example" folder. You'll need to install the library. For help there, check out our installing Arduino libraries tutorial. This one is my favorite of the NeoPixel example animations. It scrolls through the entire rainbow of colors while evenly distributing the color spectrum across the LED strip. This is a little animation that I worked up based on the "Theater Chase" animation included in the NeoPixel example code. It creates a crawling lights effect in red on a white background, like an animated candy cane! This animation creates an array of randomly twinkling white pixels reminiscent of snowfall. Not a real thing, I know... It's "Snowflakes" but blue instead of white. The 60 LEDs on your addressable LED strip can drain a lot of batteries really fast. At full brightness, the strip will pull over 2 amps!! With a capacity of only 1.5 amp-hours, the AA batteries will only power the strip at full brightness, continuously, for under an hour. If you want to get more bang for your battery-buck, there are a few tricks you can use. 60 LEDs in a linear meter is a lot of LEDs, so running them at full brightness is really... impressive. And mostly unnecessary. Luckily, the NeoPixel library includes a handy function called setBrightness(); which limits the brightness of an LED strip. You'll notice that the examples in this tutorial all include the line strip.setBrightness(64);, which sets the strip brightness to about 25%. You can set it lower before noticing a huge difference in brightness, so play with that number until you find the right balance between brightness and battery life. Sometimes a cool lighting effect is more impressive if it isn't continuous. Try dropping a delay(); into the main loop so that there's some downtime between animation cycles. Obviously, the less time you leave the LEDs on, the longer your batteries will last. Maybe you don't need 60 LEDs. Maybe 30 would do just fine. You can cut a portion off the end of the strip with a pair of standard craft scissors. Just cut across the copper pads in between the LEDs, and now you have another small strip you could use elsewhere. You can always solder them back together if you change your mind! Now go forth and add lights to everything! It's worth noting that the RedStick is powerful enough to address a lot more than 60 LEDs, but you'll need to beef up the power supply before you start chaining strips together.